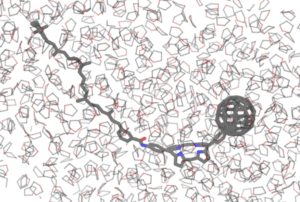 We are interested in photo-induced chemical dynamics in complex molecular systems such as liquid solutions, surfaces, biological systems, and nanomaterials. A fundamental goal is to obtain a molecular-level understanding of how electronic and vibrational excitation influence the mechanisms, outcomes, and spectroscopic signatures of chemical dynamics in the condensed phase. Since electronic and vibrational relaxation usually has a quantum nature, it is highly desirable to have methods that accurately describe the relevant quantum dynamical effects, while still being computationally feasible for large-scale systems like classical methods do. The Sun group is focused on developing mixed quantum-classical and semiclassical methods for dynamics following molecular excitation with the help of statistical mechanics, electronic structure theories, and the path integral formalism. 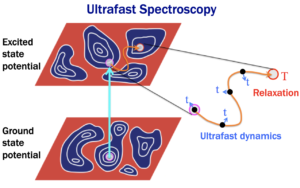 Having an insight into the many-body dynamics helps us learn the molecular lessons of ultrafast nonlinear spectroscopies and gain a deeper understanding of charge and energy transfer dynamics in light-harvesting molecules and organic photovoltaic materials.